UDM Downloads > FlashDWG-DWG to Flash Converter! Flash your AutoCAD DWG files. FlashDWG is a dwg to flash converter, is the best way to share and publish AutoCAD DWG files on the web. FlashDWG is a dwg viewer without need of dwg viewer. 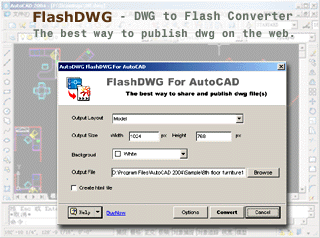 FlashDWG--DWG to Flash Converter Flash your AutoCAD DWG files. FlashDWG is a dwg to flash converter, is the best way to share and publish AutoCAD DWG files on the web. FlashDWG is a dwg viewer without need of dwg viewer. Download free trial | Buy Now Converting dwg to flash(AutoCAD to Flash, dwg to swf) is the best way to share and publish AutoCAD DWG files, better than PDF, better than DWF.no need of additional viewer or plug-in to view flash. FlashDWG is a vector to vector converter, so you can zoom in, zoom out the drawing to see the details of the drawing. FlashDWG is an AutoCAD Addins, it supports AutoCAD 2005, 2004, 2002, 2000/i and R14.